International Fire-Shield, Inc. provides a one or two-hour course to keep your knowledge of fire-retardant technology current. Summary of Lesson Plan (course description: The course covers the use of flame retardants for compliance with Chapter 8 of the LSC and ICC. The topics pertain to matching the proper qualified products to substrates, assurance of proper applications, Quality Control and the ability to document and track treated items within a facility. It covers the maintenance requirements of treated items and the supportive technical materials that need to be supplied by manufacturers. 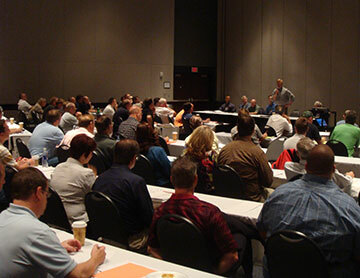 Student Performance Objectives: To gain the tools and knowledge necessary for Code Enforcement Officials, Fire Inspectors and the Authorities Having Jurisdiction in determining the ability of flame retardant coatings ability to meet Code requirements, what documentation needs to be supplied prior to the acceptance of a product for use and the Quality Control Programs a Manufacturer needs to have in place from manufacturing to providing Certification of Compliance for Flame Resistance. Method of Instruction: Course literature and Power Point Presentation followed by a Question and Answer session. Instructors: Patrick Bumpus and George Murray. Click here view Mr. Bumpus's resume. A) Introduction to International Fire-Shield, Inc. 5 mins. - U.L., U.L.C., I.C.C. 15 mins. - Maintenance Requirements of Flame Retarded & Flame Resistant Materials (IFR) 15 mins. - Closing the Loop, Questions and Answers 10 mins. To request an FRU Training Course, call us at 1-800-513-5134!